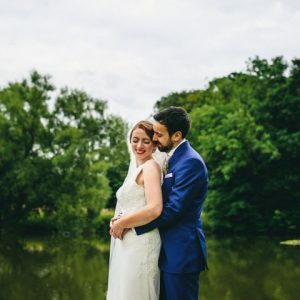 Last week I went along to see James at Shottle Hall in Derbyshire, to have a look round the venue and see what they had to offer my Boho Brides. On first appearances I was very impressed with the building, it was of a good size with very well looked after grounds, but not to big that it became impersonal! Once inside I liked it even more. The house built in 1861 was of a very high standard, it was light, bright and had obviously had a referb quite recently. Some times old Victorian buildings can look lovely on the outside but when you get inside you can be let down by the tired decor. Shootle hall I’m happy to say is nothing like this, it is beautiful inside and out. Set in the gentle landscape on the edge of the Peak District National Park and forming part of the famous and exquisite Chatsworth House Estate, Shottle Hall is a lovely English country house offering a stylish blend of traditional elegance in a contemporary setting. Their are a selction of rooms that are licnesed for Civil marriage sand Partnerships, as well as a Semi permanent Marquee to hold bigger functions and larger scale weddings. On most occasions the Wedding will be held in the Lounge, which holds 80 people, with welcome drinks in the Library if the weather doesn’t permit drinks outside in the garden. 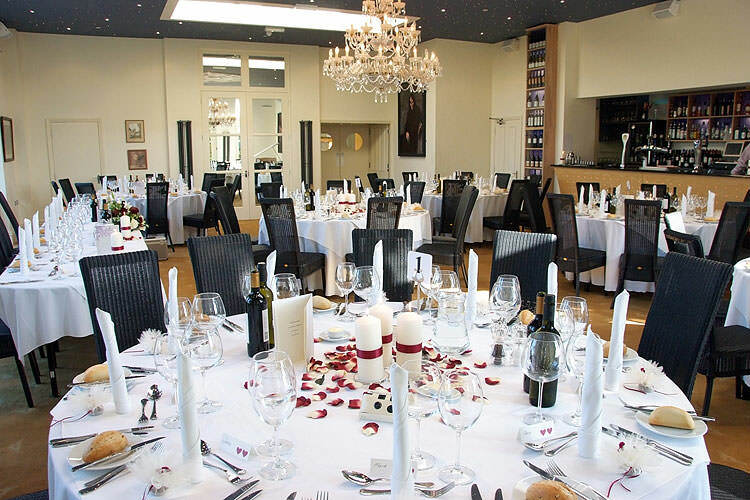 The reception then takes place in the the Orangery restaurant which can accommodate up to 90 guests for dinner and up to 150 guests for a buffet/reception. The Restaurant is modern in appearance, with minimal fuss which gives each couple more choice on their own decoration ideas. What I loved was the twinkle ceiling with star drop effect lighting, and the black and white dance floor. Also the digital white grand piano that spookely plays itself!! Great if you want to plug in your own iPod for the wedding breakfast! 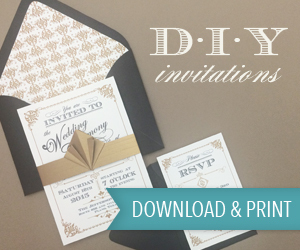 If you have a bigger wedding party then the Marquee is perfect for you. The Marquee while benefiting from stunning views over the Ecclesbourne valley also has its own self contained bar and lounge areas which can seat up to 250 guests. 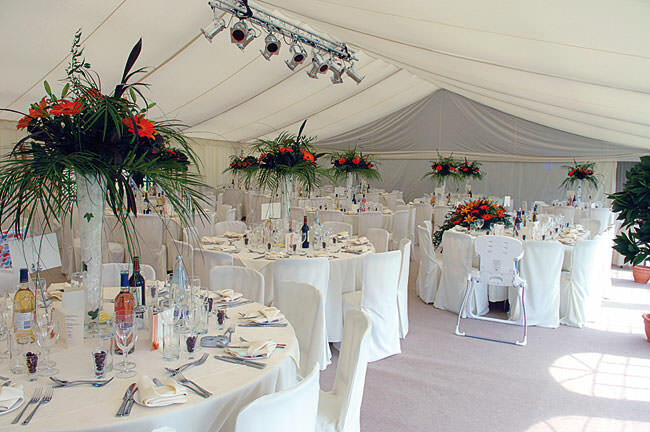 The marquee is capable of being extended to cater for up to 500 for larger occasions, glamorous dinners, buffets and events. Along with the great mixture of rooms and reception options, Shottle Hall also has 8 individually decorated bedrooms, so there is something to suite everyone taste. They all have their own character and en-suite bathrooms or shower rooms, flat screen televisions, free broadband internet connection. 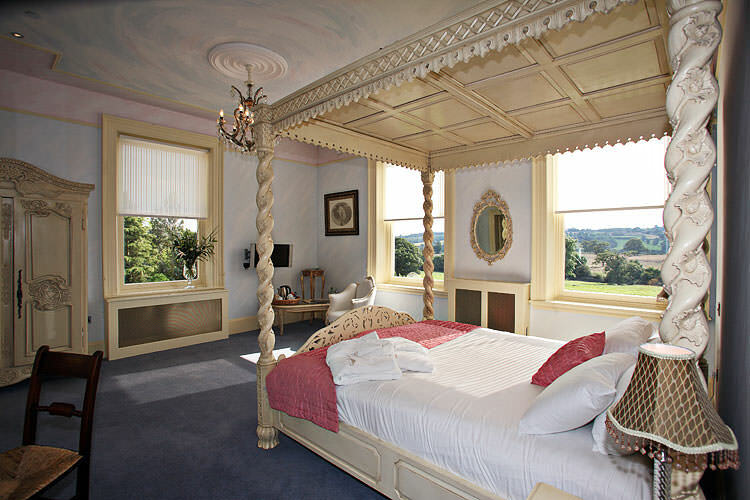 The Bridal Suit has fantastic views over the Ecclesbourne valley, the Shottle Hall bridal suite is a large, sumptuous double room with antique furniture and a traditional four poster bed. A generous bathroom featuring a large double ended roll top bath and separate shower ensure your time here will be a memorable one. I really Like Shottle Hall. 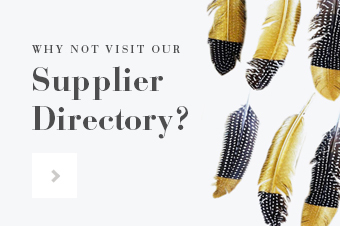 James and his team take a very hands on approach to the wedding co-ordination, making sure that the same person sees you throughout your plans. The hall also offers complete exclusivity as all 8 rooms are included in the price of the venue hire, so strangers gate crashing the reception!! 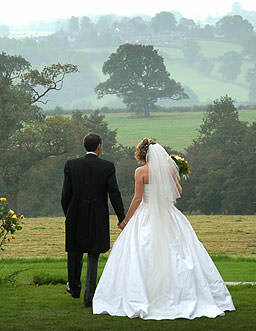 James also has some Special offers on bookings taken for Low season weddings, in January, February and March 2010. They are also taking bookings for Valentines day. 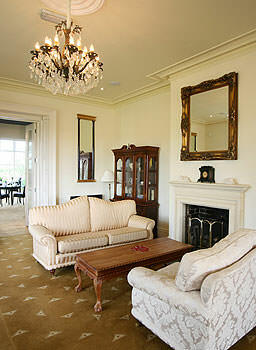 Watch out as well for Shottle Hall’s ‘Bespoke Wedding Venues’ which will be launching in the next few months. 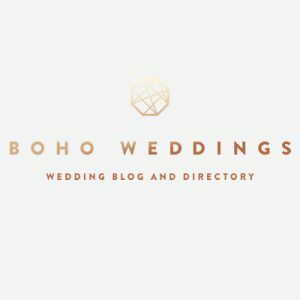 A new service offered to brides and grooms looking for venues with a difference…….watch this space for details Boho will be first with the information. Great review. I dream of having my wedding in a place like this. It looks amazing. I am so jealous of anyone who can have such a ceremony. A great review for a lovely venue. We recently performed in the Shottle Hall marquee and feel in love with the place as soon as we walked in.